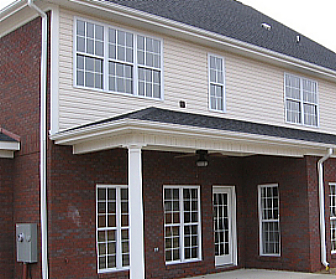 There are a lot of good siding alternatives to brick. The most common and best options are wood, vinyl, stucco, and fiber-cement. Vinyl is a popular choice and a solid and reliable one as well. It’s much cheaper than brick and is easy to care for. It can be used as a complete siding job or as a supplement to brick, as seen in this photo. Vinyl is available in horizontal lap over strips or in a variety of “shingle” looks. Vinyl won’t rot, peel, dent, or scratch. It never needs painting. A garden hose is all you need to keep it clean. If you find a look you like among the many styles available, it makes a good value choice. 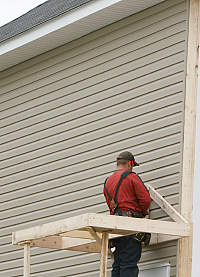 Hire a company that specializes in vinyl siding, not one who may do it as a sideline. This is one of those things where a small construction company may advertise vinyl siding installation as one of its services, while they actually subcontract the job to someone else.